I have to admit that I was shocked — in a very good way — by watching Young Mr. Lincoln. I had just watched Abe Lincoln in Illinois a few days prior, and thought that no other Hollywood attempts at telling the story of Abraham Lincoln could compare. I was quite wrong. I’ve been a fan of Henry Fonda for many years, and I would never have thought that he would be able to realistically portray Abraham Lincoln. I was totally wrong — here, a young Henry Fonda portrays a young Abe Lincoln, over a period of roughly 10 years, ranging from the loss of his first love to his time in the legislature, and culminating in his first large case — defending two young men in a murder trial. The movie ties into several of the characters that will become central to Abraham Lincoln’s life, including his future wife, Mary Todd, and his rival, Stephen Douglas. But the central part of Young Mr. Lincoln deals with a murder that happens in Springfield, Illinois, during the Centennial celebration. A fight between two brothers and a drunken bully ends in the bully’s death. Abe Lincoln defuses a lynch mob from killing the two brothers, with a combination of wit, bravado, and strength. An excellent scene that needs to be seen to be appreciated. Likewise, after Abe takes the case of defending the brothers, the courtroom scenes are an excellent combination of Abe Lincoln’s well-known homespun humor, wit, and intelligence. Leading to a surprise ending — that’s been copied many times since. I strongly recommend Young Mr. Lincoln and rate it 4 stars out of 5. 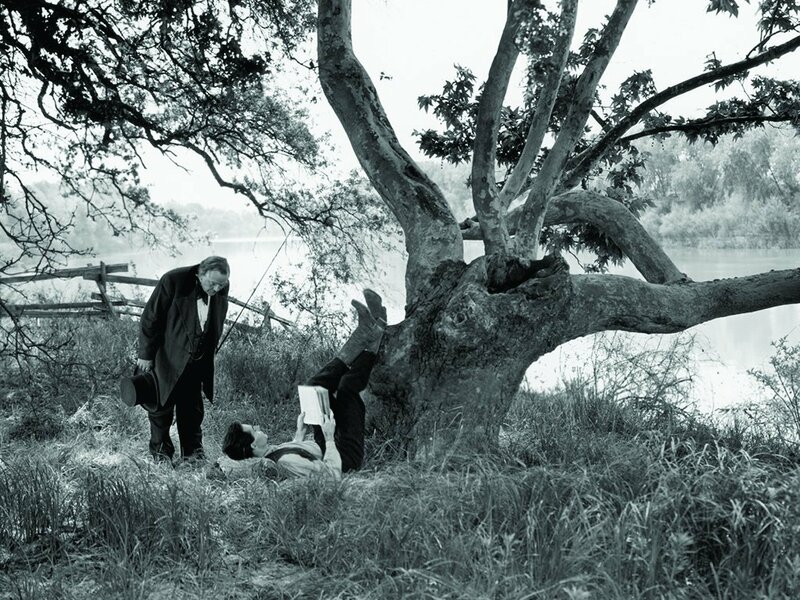 Has Young Mr. Lincoln — the first cardinal masterpiece of director John Ford’s career, and the finest film of that epochal Hollywood year 1939 — been neglected because people fear it’s a stodgy history lesson? 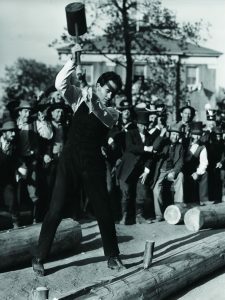 Even Henry Fonda, drafted to play the title role, was reluctant till Ford testily explained, “This isn’t ‘The Great Emancipator,’ for God’s sake — it’s a movie about this jackleg lawyer.”  And so it is: a small, slow-gathering village tale about a young man whose biggest moments — such as losing the love of his life — occur between scenes, and whose emergence as a historic figure is decades away. Yet the essential Lincoln is being forged in luminous scenes that unfold with the simplicity of fable, only no one knows it’s a fable yet. The French title for the movie says it beautifully: Toward His Destiny. The script, by Lamar Trotti, introduces Lincoln as a frontier storekeeper and drolly inadequate politician. In an early scene, we see Abe receiving his first books of law in a casual transaction with a pioneer family on their way to make a new home in the wilderness. But was it Trotti or the director who decided that this same family should circle back into Abe’s life years later for the dramatic heart of the film, a murder trial in which his wit, ingenuity, and bedrock decency shape Lincoln’s first public triumph — and that neither Lincoln nor the family recognize they have met before? That’s typical of the movie, in which what is most important, most definitive, most valuable, is always outside the frame, out of reach, beyond naming. Even triumph is imbued with a heartbreaking sense of loss. Prosecutor John Felder: Mr. Lincoln should know that the mere fact that a prospective juror knows counsel for the state does not disqualify him. Abe Lincoln (Henry Fonda): I know that, John. What I’m afraid of is that some of the jurors might not know you — and that’d put me at a great disadvantage. 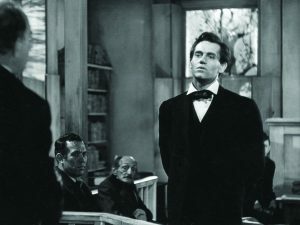 Abe Lincoln (Henry Fonda): [to John Felder] I may not know much of law Mr. Felder, but I know what’s right and what’s wrong. And I know what you’re asking is wrong. Abe Lincoln (Henry Fonda): [cross-examining Cass] J. Palmer Cass. John Palmer Cass: Yes, sir. Abe Lincoln (Henry Fonda): What’s the “J” stand for? Abe Lincoln (Henry Fonda): Anyone ever call you Jack? Abe Lincoln (Henry Fonda): Does “J. Palmer Cass” have something to hide? 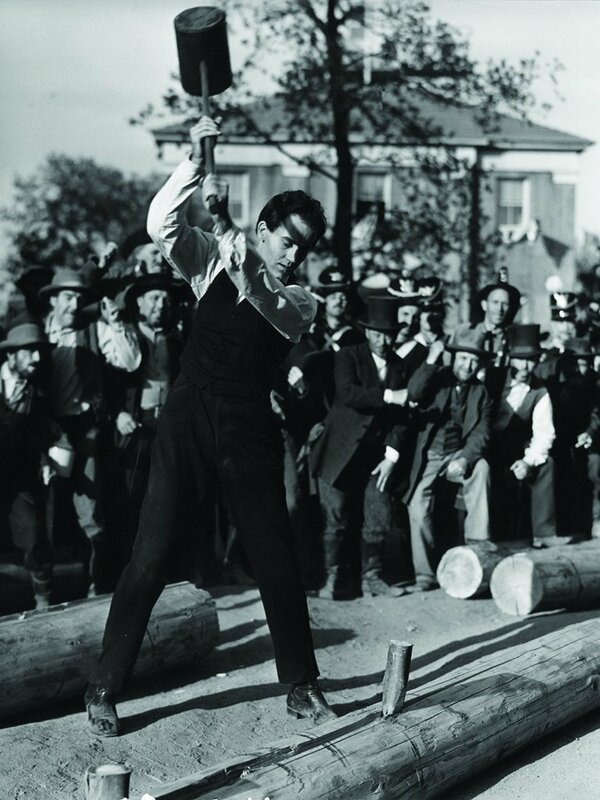 Abe Lincoln (Henry Fonda): Then what do you part your name in the middle for? John Palmer Cass: I got a right to call myself anything I want as long as it’s my own name! Abe Lincoln (Henry Fonda): Well then if it’s all the same to you, I’ll call you Jack Cass. Abe Lincoln (Henry Fonda): [questioning Cass about Scrub’s death] What were you and Scrub arguing about? John Palmer Cass: I’d rather not say. Abe Lincoln (Henry Fonda): Oh, you’d rather not say. Well, Jack, I’d rather you did say. John Palmer Cass: All right. We was arguin’ about politics. Abe Lincoln (Henry Fonda): Well, that’s something new to argue about. John Palmer Cass: I’ve learned some since, but I told Scrub I thought you had at least as much political sense in you as Stephen Douglas. Scrub got as mad as a wet hen and said you didn’t! Efe Turner: Ain’t you goin’ back, Abe? Abe Lincoln (Henry Fonda): [as the “Battle Hymn of the Republic” begins playing softly in the background] No, I think I might go on a piece … maybe to the top of that hill. Henry Fonda wore specially made boots that made him appear taller. The trial of William “Duff” Armstrong, on which the fictionalized defense of Matt and Adam Clay shown in this movie is based, actually took place in 1858, when Lincoln was a successful railroad attorney and soon to be a nominee for the Senate. The other person accused of murder had been convicted in a separate trial several months earlier. John Ford and producer Darryl F. Zanuck fought an extended battle over control of the film. Ford even had unused takes of the film destroyed so the studio could not insert them into the movie. One scene that Ford insisted on cutting was a scene where Lincoln met his future assassin, a very young John Wilkes Booth. Final film of Alice Brady. Academy Award Theater broadcast a 30 minute radio adaptation of the movie on July 10, 1946, with Henry Fonda reprising his film role.